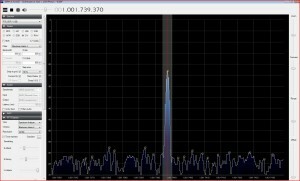 The popular SDR USB stick, with the R820T tuner and RTL2832U demodulator inside – some investigations. Signal was supplied at 1000 MHz, from a virtually perfectly stable source. At some point, the crystal was touched with a finger (making sure not to touch any of the traces or components, as this could capacitively affect the oscillator). Surprisingly, the frequency first goes down (-0.6 ppm), and then up (+2.5 ppm). Red line shows the typical characteristics of a SC (or IT)-cut crystal. 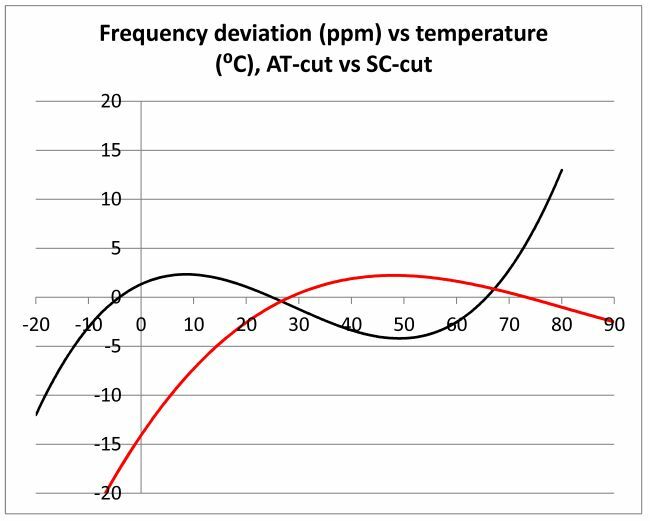 Rather than the expected AT-typical transition through a minimum frequency, when going from about 60-70 deg C, down to 35 deg C (body temperature), we observe just the opposite behavior (more like SC-type) – reference frequency goes through a maximum (which is a minimum of the shown signal frequency, if the signal is a constant 1000 MHz). So it seems, the manufacturer did actually consider a relatively high operating temperature of this device when selecting the crystal, which is running at about 60 degrees – just the rough temperature of the board/crystal. 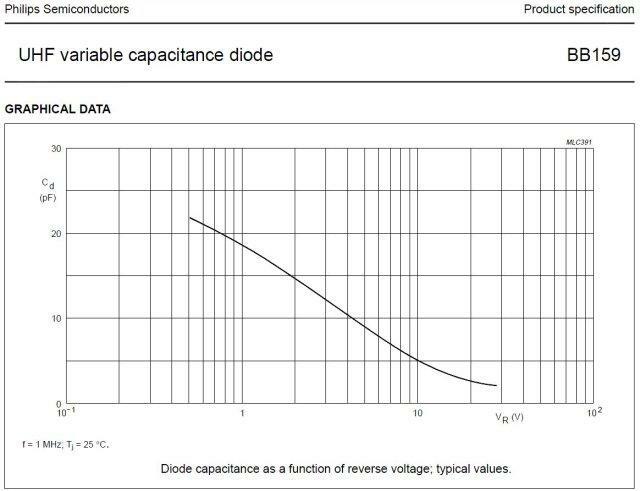 An AT-type would have been much counter-productive, because this is optimized for constant frequency over a broad range of temperatures, say, -10 to 60 deg C. However, for the SDR USB stick, the temperature related frequency change should be minimal at and around the hot operating condition of the board – I don’t think this is just coincidence, but somebody acutally put some thought into getting a device frequency stable, without any ovens or other compensation devices. 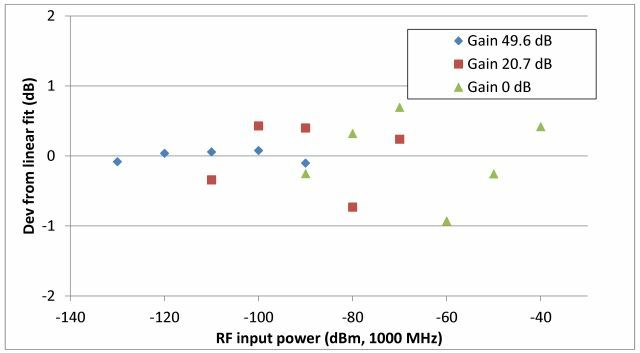 The R820T has the nice feature of a build in pre-amplifier, 0 dB to 49.6 dB nominal gain. 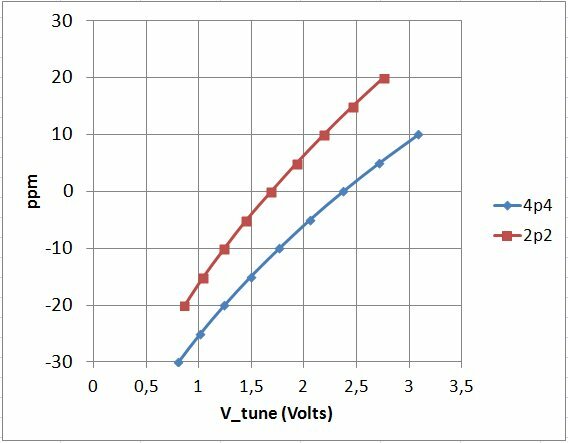 Now, the question is, with all the nominal values, what is the acutal gain, and how does this change with frequency? 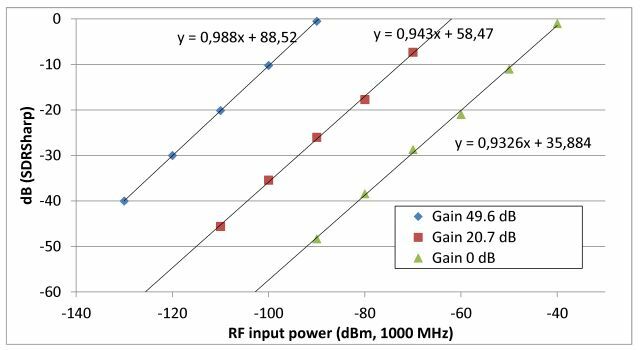 With the established setup, the frequency-stabilized SDR USB stick (28.8 MHz supplied by a HPAK 8662A, at 500 mV level), and the 8642B source, the gain of the R820T was set to the various values, step by step, and the RF input level varied to keep the SDRSharp FFT peak level at exactly -25 dB. The -25 dB reading can be taken to about +-0.2 dB, when looking at the FFT display. The test was carried out at two frequencies, namely, 141 MHz and 1000 MHz. Don’t do such evaluation anywhere close to multiples of 28.8 MHz – there are some reference-related spurs that can affect the accuracy. 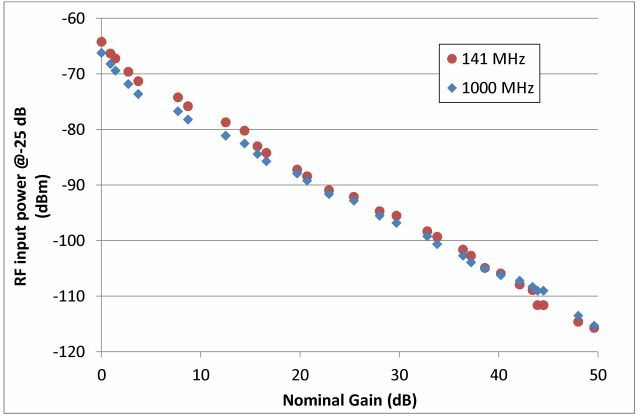 Interestingly, at 0 dB gain, a bit more power is needed at 141 MHz to get -25 dB, which means, the R820T is a little bit less sensitive at 141 MHz than it is at 1000 MHz, but only at the 0 dB gain setting. At higher gains, the data are more or less superimposed. Note also that the 43.9 dB and 44.5 dB gain settings have actually identical gain! No idea why. These are the acutal gains, calculated from above data, vs. the nominal gain. Pretty linear, but clearly some positive deviation at the low gains. Accordingly, the preamp provides a bit more gain at lower frequencies, say, 141 MHz, especially when set to high gain, above 35 dB nominal. Below 35 dB, gains for 141 and 1000 MHz are virtually identical. 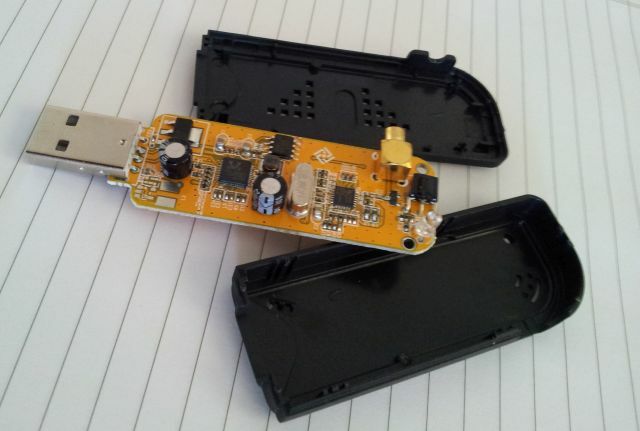 If you have a SDR USB stick of a different type, and want to have some gains-levels etc measured, just let me know! I might be interested. Some more linearity tests, now over a narrow range, with a precisely linear and calibrated source, measured at 1000 MHz, otherwise all the same is in the earlier post. 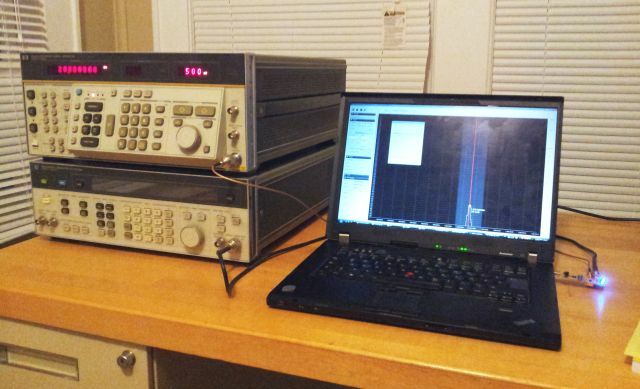 These tests were done at a 0 dB gain setting, and the input power was varied in 1 dBm steps. 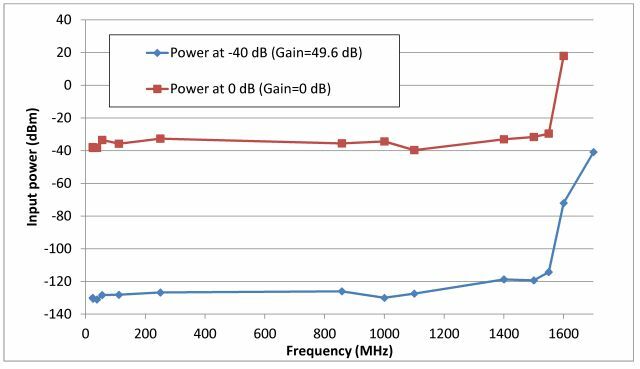 The results speak for themselves – the SDR USB stick is pretty accurate, if you want to do a relative comparison of power levels over a range of 10 dB or so. 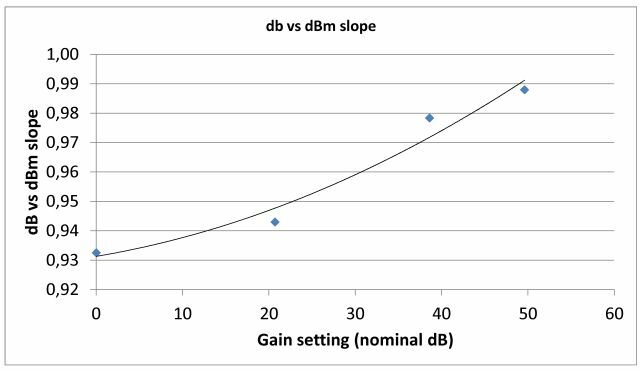 Accuracy might be in the range of +-0.5 dB, or better, provided that the slope has been determined for a given gain setting (don’t change the gain settings, if you need to do accurate measurements). 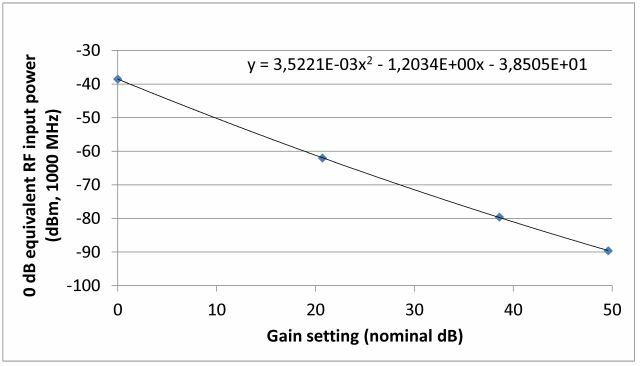 If you want to measure insertion loss, the best way would be to vary the source power in calibrated steps (by a 1 dB high precision attenuator), and just use the SDR USB at a constant dB reading, over a narrow range of +-1 dB, then your measurement error will be limited to virtually the precision attentuator error only. 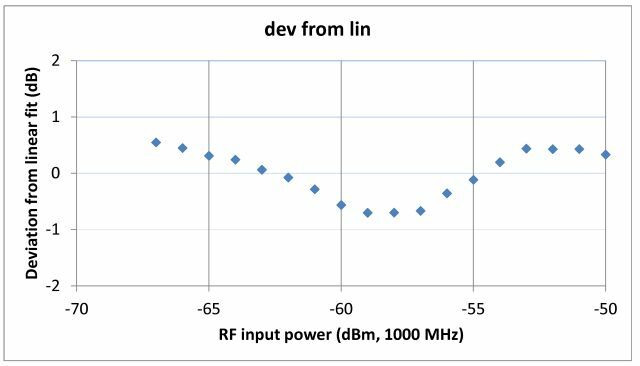 For such tests, it is always good practice to have a 6 dB or 10 dB attenuator at the SDR USB input, to avoid artifacts caused by the non-negligible return loss (SWR) of the SDR USB stick input. 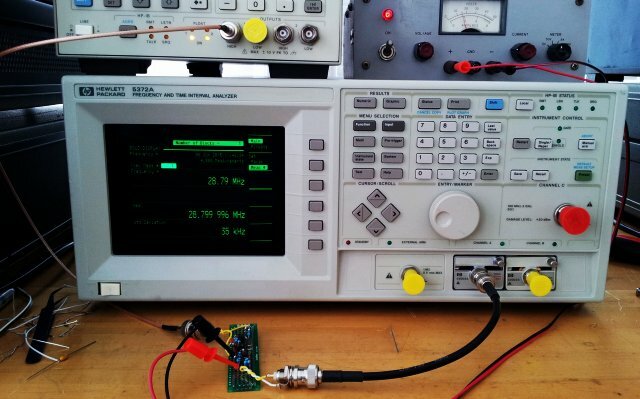 An open item – to go further, one would need to check linearity at various frequencies of interest, etc., but this is all beyond the scope of the SDR USB stick – if it comes to below 0.5 dB accuracy, that’s something better done in a cal lab anyway, nothing that is necessary too frequently out in the field. 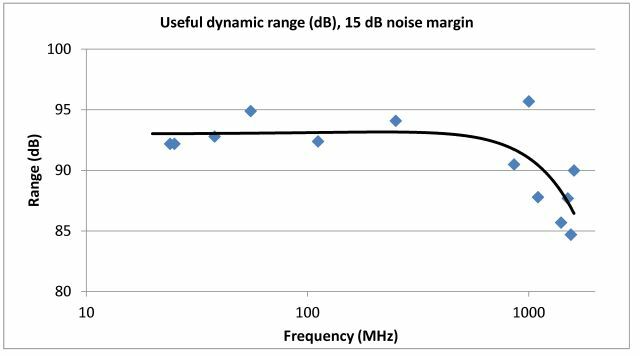 For comparison, with a high precision dedicated level measurement receiver (like the Micro-Tel 1295), achievable relative level accuracy (not linearity) over 10 dB is about 0.03-0.05 dB – over a much wider frequency range. Also note that most commonly available spectrum analyzers (Rigol, etc.) aren’t all that linear, see their specs. 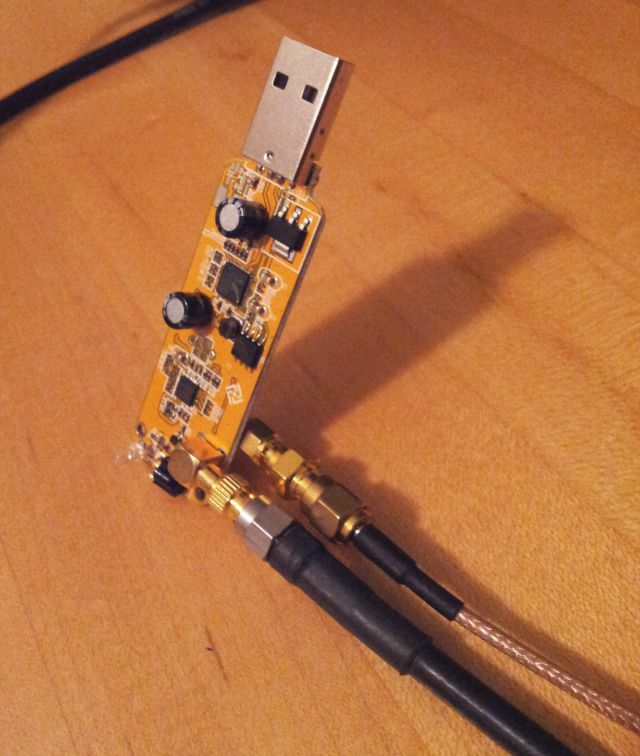 There are some good reasons to always carry one of the SDR USB sticks around – it’s a great little spectrum analyzer. But hold, what does it have in common with the purpose build-professional analyzers selling for USD 1k or more? It certainly has one particular advantage, the SDR USB stick is very small, a mere 10 gramms, and only needs about 1 Watt of power. And it covers the full span of frequencies of general interest (at least is you add an upconverter, for low frequency and HF stuff below 24 MHz). Well, what are some key requirements of a good spectrum analyzer? 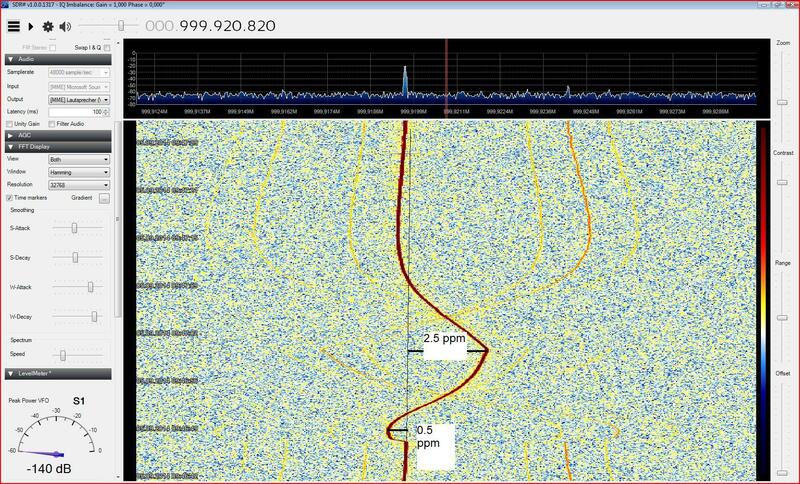 (2) Intermodulation distortion. More complicated, will be analyzed later. (3) Low input return loss (otherwise, amplitudes will be inaccurate). Will be measured later, the VNA rests back home in Germany. 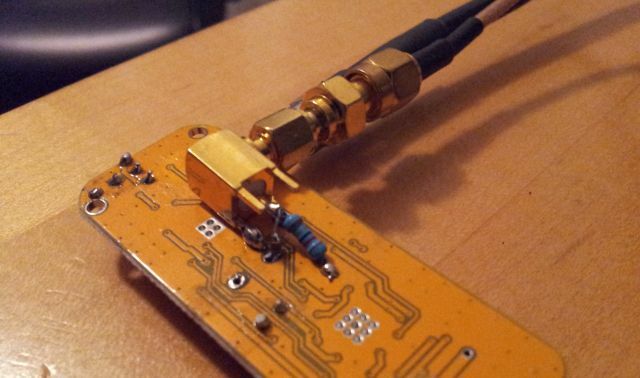 But this limitation can be easily overcome by putting a 6 dB attenuator in front of the SDR USB. 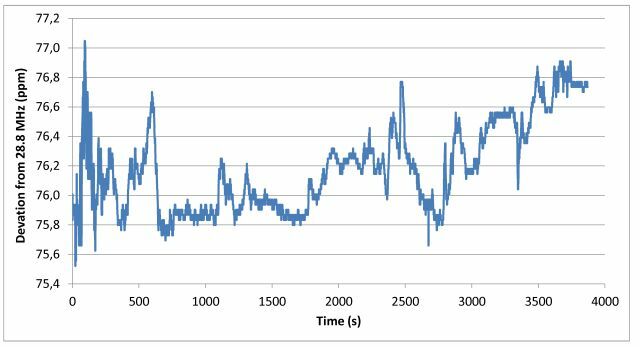 (4) Frequency accuracy – this is not great, but stable within a few ppm. If you want to add a precision reference, see earlier post. 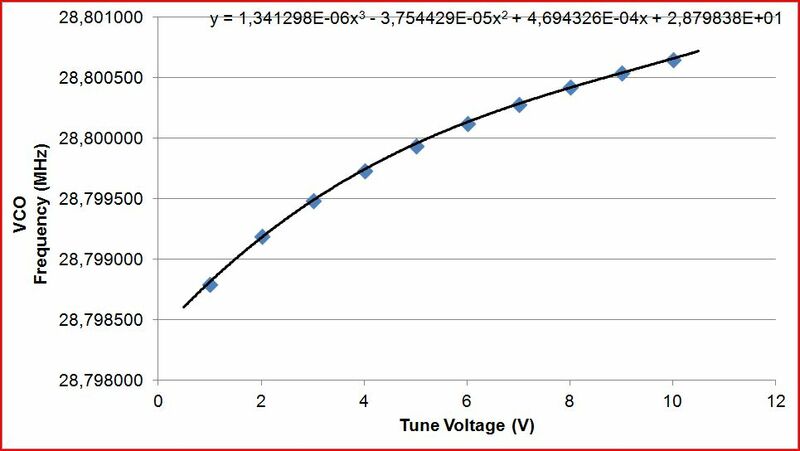 (5) Amplitude accuracy – it needs to be very linear (i.e., a 1 dB step in signal strength must convert to a 1 dB step on the readout, same for 10 dB steps, etc. ), and this should not very too much with frequency. 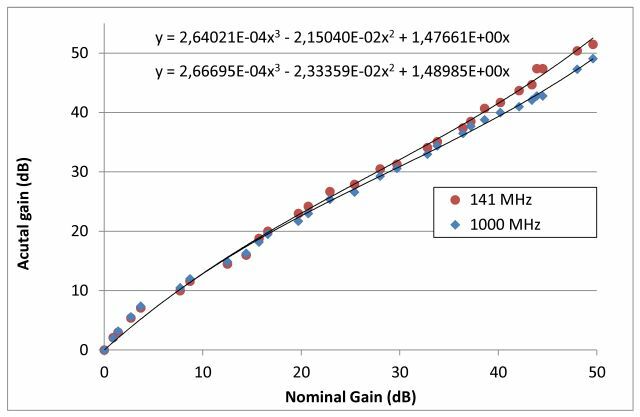 Absolute amplitude accuracy (i.e., if 1 dBm is fed into the RF input, it needs to read 1 dBm power) – not applicable to the SDR USB stick, it only shows power in nominal, un-calibrated dB. Well, let’s tackle item 5, and work out some absolute calibration. The R820T tuner of the SDR USB stick under consideration here has a build-in preamp. This has nominal gains from 0 dB, to 49.6 dB. Some gain curves have been reported for other SDR USB sticks elsewhere, let’s do some in-depth analysis. 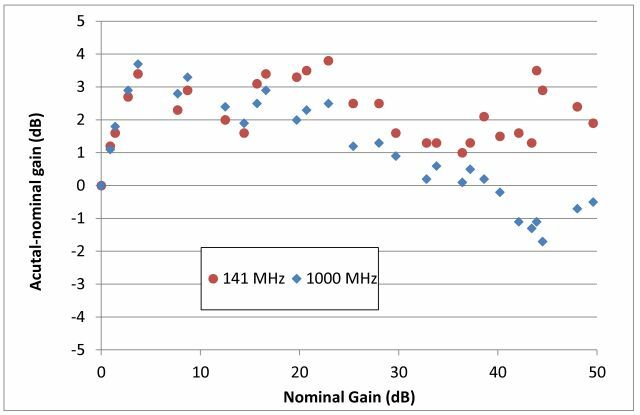 With 1.024 MSPS, 65536 FFT bins, RF frequency of 1000 MHz (HPAK 8642B), reference at 28.80 MHz – 500 mV (provided by an HPAK 8662A) and gains set to values of 0 dB, 20.7 dB (about mid-range), and 49.6 dB (max gain), the input RF power (which is calibrated in absolute dBm, and fed to the SDR USB stick by a low-loss cable) is varied in 10 dB steps, and the dB reading taken from the SDRSharp FFT spectrum display. Note that fully accurate reading of the dBs is only possible if the frequencies (reference and signal) are dead-stable, otherwise everything will be drifting up and down, and the FFT bins won’t be in the same place all the time. Everthing is quite linear (a good fit with just a line), but you notice, the slope of the lines change a bit, depending on the gain setting. In other words, a 1 dBm chain will not always result in an exactly 1 dB change on the SDSSharp display, at high gain setting, it will almost fit, at 0 dB, there is only about 0.93 dB change (readout) for every 1 dBm power change at the input. Well, over 40 dB, that’s an error of about 3 dB, not much, but more than desirable. After some more measurements, at 38.6 dB nominal gain, it relationship of level slope vs. gain seems pretty clear, at least at 1000 MHz. Less than 1 dB – that’s within the measurement error of the calibration apparatus! Next interesting item for practical use, the RF input power needed to get a 0 dB reading – the absolute power calibration for this SDR USB stick. This seems to vary from stick to stick only by 2-3 dB, but I don’t have a big set of sticks, multiple lots etc. – so this might be shifted depending on the exact device you are using, but trends should be the same, for all R820T sticks. 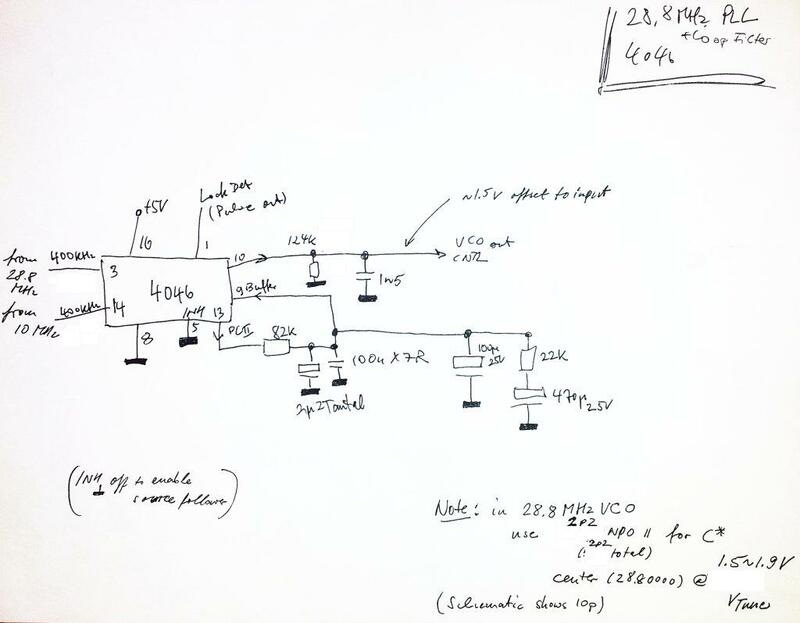 According to this diagram, for any measurements above -40 dBm, you need a good set of attenuators, to bring the signal level down. In fact, the SDR USB might actually make a very decent subtitution type attenuation test receiver, if you put it in line with a precision attenuator, and only use a few dBs of span of the SDR USB (well-calibrated) to determine the signal levels. I checked quickly for drift of the level calibation vs. R820T temperature – there doesn’t seem to be any strong effect, which is a good sign that there is no need to re-calibrate the levels all the time. After looking around in the web, there doesn’t seem to be a whole lot of information out there on the sensitivity and dynamic range of the SDR USB devices, at least not for the type I’m using here. Even the R820T datasheet isn’t all that clear – there are various versions of the R820T, also using different clock frequencies, with 28.8 MHz, being the most popular lately. Therefore, time for some measurements. 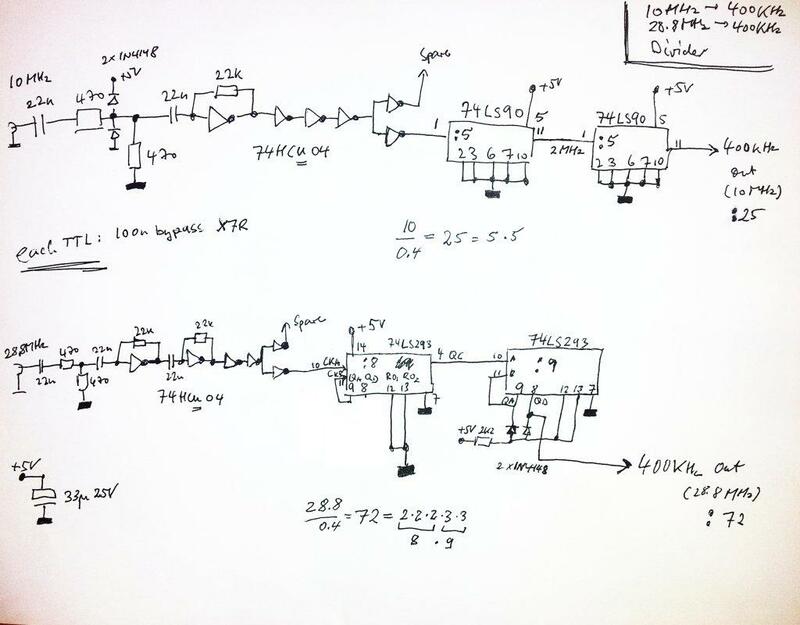 (1) HPAK (formerly HP, then Agilent, now Keysight) 8662A Signal Generator as the reference source, 28.800 MHz, 500 mV level. 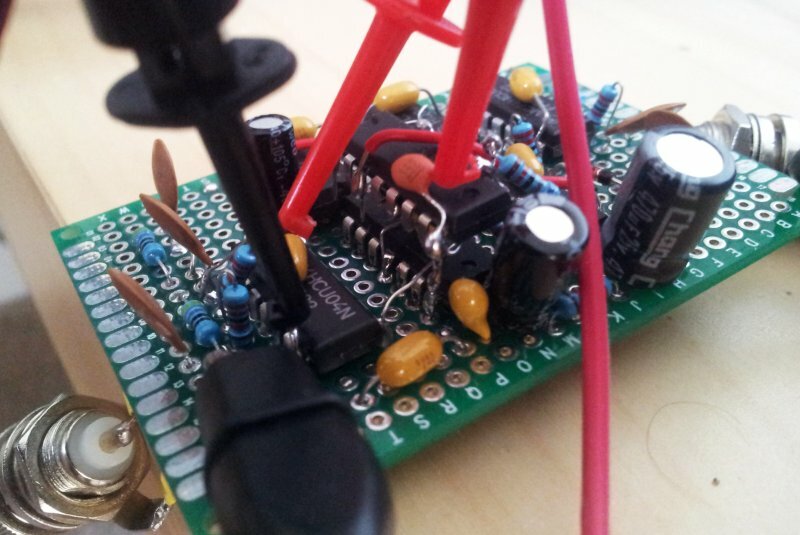 (2) HPAK 8642B Signal Generator as the test signal source. This has a calibrated output from -140 dBm to +20 dBm, and very clean and free of spurs, and provides up to 2.1 GHz. Absolute amplitude accuracy is about 1 dB, linearity is considerably better. As it says on the instrument cover – 70 pounds, “two person lift”. The 8642B is phase locked to the 8662A clock, via a common 10 MHz reference signal. So even with drift, there can’t be any frequency errors getting into the way of our precision testing. (3) Some well-shielded test cables, RG223/U, and adapters to link to the MCX connector (use a good test cable, but not your best – most of the SMA to MCX connectors aren’t all that precise, and may damage precision SMA connectors). (4) The modified SDR USB stick, see earlier post. (5) Laptop PC, running SDRSharp. 1.024 MSPS, all automatic gain and frequency adjustments disabled, I/Q correction enabled. First, the sensitivity check. Tuned the SDR USB to various frequencies, and measured the input power (dBm needed to get a -40 dB reading, at max gain of the SDR USB – 49.6 dB nominal), this is about 15 dB above the noise floor, and still a signal level that is very stable and can be accurately measured. 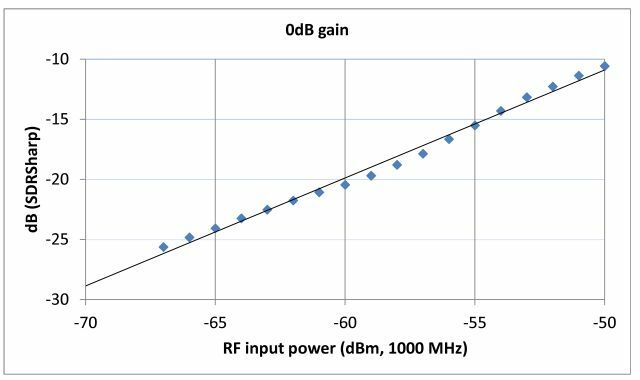 Afterwards, set gain to 0 dB, and increased RF input power until 0 dB reading was obtained – this is the maximum power that can be reasonably fed to the SDR USB (no damage will occur up to +10 dBm; and even +20 dBm doesn’t seem to do much, at least not if only applied for a short time). Sensitivity is quite constant over a pretty large range, up to 1500 MHz, no problem. Lowest frequency the thing can handle is about 24 Mhz (doesn’t tune any lower). Note that there are some spurious signals present around 28.8 MHz, (internal) ref clock leakage, and its 2nd harmonic. The RF input power (about -130 dBm) to get -40 dB amplitude, at max gain of the SDR USB, this is quite remarkable, and still about 15 dB above the noise floor. So the R820T exhibits very high sensitivity, no doubt. Here is an estimation of the dynamic range – “useful” because, it is still has some margin for noise. For the full dynamic range, add about 15 dB. About 93 dB (108 dB full range, from noise floor, at 49.6 dB gain, to 0 dB at 0 dB gain). One of the shortcomings of these handy and cheap SDR USB sticks is the offset of the reference, and the drift. First, lets see what we have: in the meantime, I have two more or these little units to play around, and all have about 70-100 ppm offset, positive. The small silvery metal can is the crystal. Any temperature change will cause this to slightly change frequency. So, what about the crystal drift? Easy enough, just hooked up one of the sticks to a counter (with stable timebase; you need to use high impedance probe, otherwise, proble will pull the crystal frequency), and logged the frequency values for an hour, after “cold” startup (stick with no case). 1 to 2 ppm, that’s not all that bad! Still, in the world of precision oscillators, it’s ridiculously drifting. So for any precise characterization of the SDR USB device, we need to get this under control. Some have tried to replace the crystal by a TCXO, but even with this, it will be challenging to break the 1 ppm (1 kHz at 1 GHz!) mark. 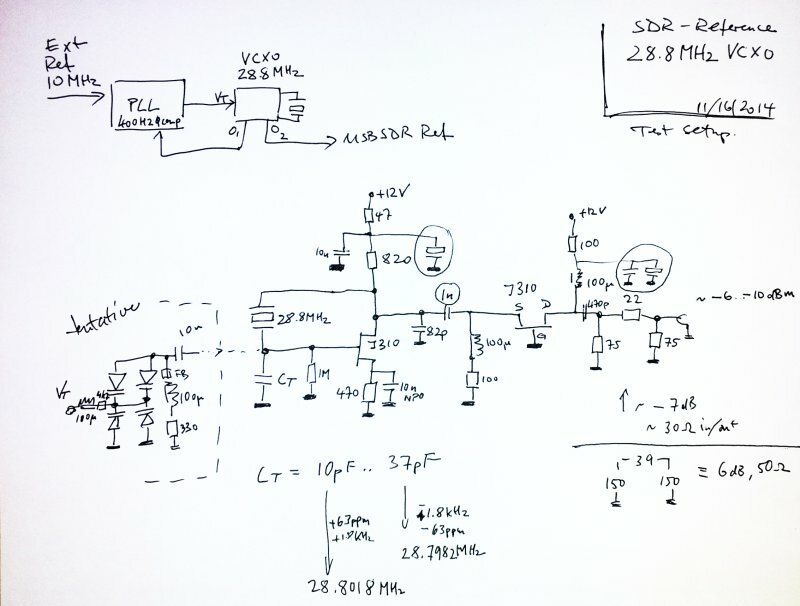 A quick look at the datasheets reveals that pins 8 and 9 of the R820T are the input/output of the xtal drive circuit, and pin 10 forward the clock signal to the RTL2832U, to safe some parts, and cost. 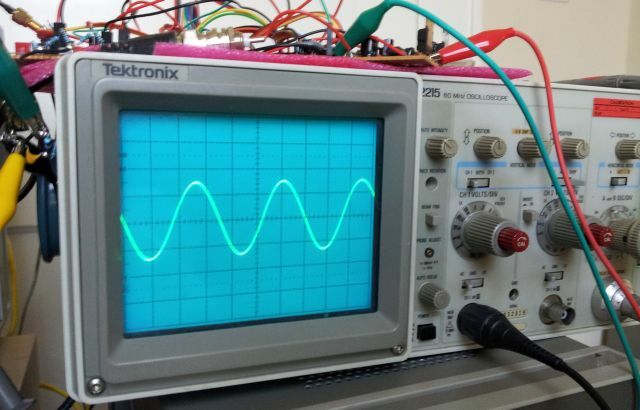 The signal, amplitude is about 1.5 Vpp, with a DC bias of 1.2 V.
Therefore, if we want to substitute the crystal, we have to feed a few dBms of power at 28.8 MHz into pin 8, and leave pin 9 unconnected. The feed line (50 Ohms) requires some adequate termination. We also need to provide a DC block, with a little coupling capacitor. A SMC connector, terminated with 82 Ohm (which will be in parallel with the impedance of the R820T, hopefully giving about 50 Ohm, or close enough), and with 0805 10 nF capacitor, connected to pin 8 of the R820T. 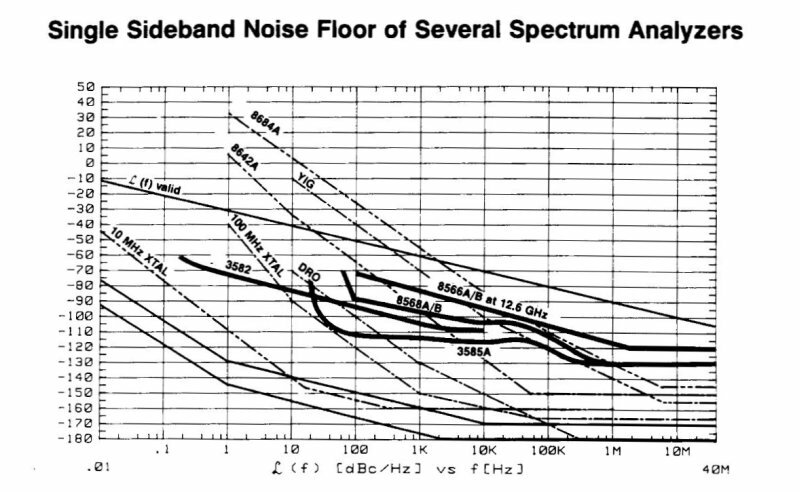 As for the new reference source – nothing less than a HPAK 8662A, which is a real marvel of engineering and one of the best sources I can suggest for any tests that require low phase noise close to the carrier. It is stable to better than 0.0005 ppm, per day – compare this to the 1 ppm, per hour…..
Sure, not the mention – the 8662a carries 80 pounds of electronics, a big fan, and uses about 300 Watts of power to keep things clean. 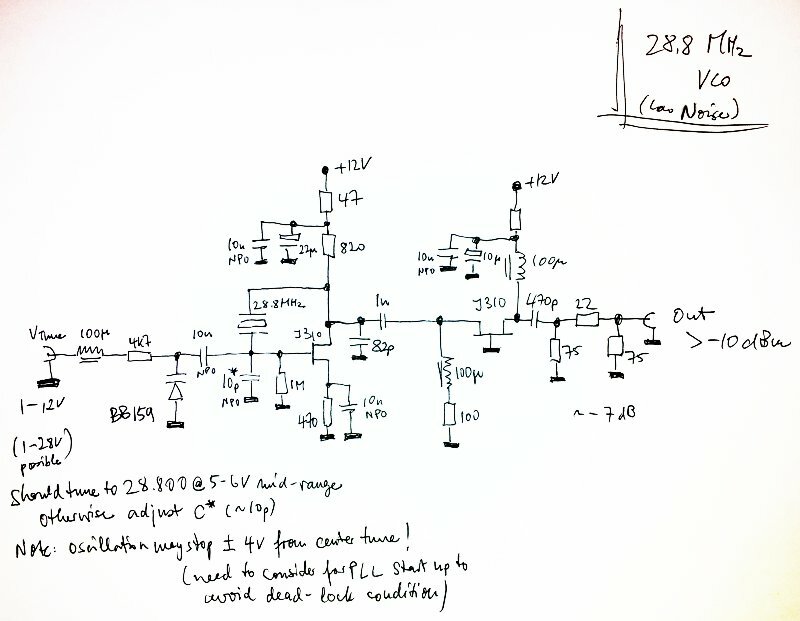 The reference level needed to drive to R820T oscillator – just by trial and error, things start to work at about 400 mV, and up to 1 V of signal doesn’t seem to change anything. So I set the level to 500 mV into 50 Ohm, and this seems to work well. Interestingly, the R820 T seems to work from about 28.75 to 28.85 MHz reference, with no change in performance (at least nothing obvious), except, of course, for the frequency shift. At frequencies below about 28.72, and above 28.89, the stick crashes-no more data comming. Checking the math, this all makes sense – for 28.75 MHz, a reading of 1001.739 MHz would be expected, and 998.267, for the 28.85 MHz reference.